Top row: Martha Coakley (left), Charlie Baker. Bottom row from left: Jeff McCormick, Evan Falchuk, and Scott Lively. In the beginning there were gubernatorial candidates galore, half of whom are still with us, half of whom dropped out along the way. At the Democratic Party convention in June, delegates kicked a couple candidates off the ballot. Two other Democrats and a Republican lost in the party primaries in September. So who’s left? ■ Republican Charlie Baker Even before his face showed up on TV ads morning, noon, and night, his name was familiar to voters from 2010, when he ran unsuccessfully for governor against Deval Patrick. A Cabinet member in both the Weld and Cellucci administrations, Baker has run his 2014 campaign as an exercise in balancing his traditional Republican agenda of conservative budgeting and welfare reform with a concerted effort to appeal to women and minorities. He has decried one-party rule and positioned himself as an independent-minded candidate who will be able to forge compromise with the Democrats on Beacon Hill. ■ Democrat Martha Coakley The sitting attorney general, Coakley would become the first woman elected governor in the state. She has focused her campaign on expanding early childhood education, equal pay for women, and a “fair shot” for workers. And she has appealed directly to women — at times portraying herself as an outsider to a political old boys’ club. Determined to banish lingering doubts from her disastrous 2010 Senate loss to Scott Brown, she has been frank about her challenge. “I’ve been weathered. I’m tough. I come back and fight again another day,” she said in September. ■ Independent Evan Falchuk Sure, he wants to be governor, but he’s got a different agenda too: generating enough support for his new United Independent Party that it gains official party status. That is 3 percent of the vote next week. The party, he hopes, will bridge the left-right divide and restore cynical voters’ faith in government. ■ Independent Jeff McCormick A wealthy venture capitalist with no political experience, McCormick hired veteran staffers from both major parties in a bid to appeal to middle-of-the-road voters who are turned off by the two-party system and would appreciate his business experience. His campaign has been largely self-funded. ■ Independent Scott Lively A self-described “Bible-believing Christian” minister whose antigay activities have drawn attention from the Human Rights Campaign, Lively has acknowledged running a part-time campaign. 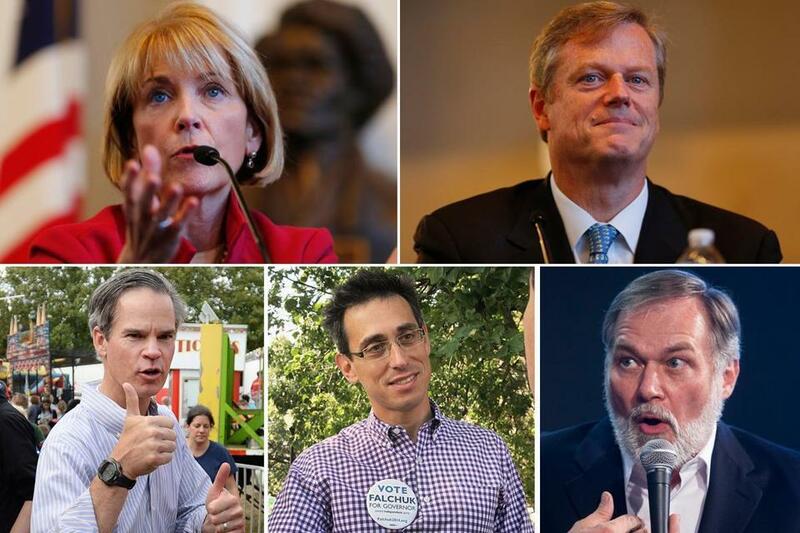 Here’s a look at where the major candidates for governor, Martha Coakley and Charlie Baker, stand on some key issues. September 2013: Three years after she appeared to be finished politically, Democratic Attorney General Martha Coakley announces she’ll run for governor. “Massachusetts is poised to take off. We can either grab this moment and move forward together, or risk falling behind,” she says. Republican Charlie Baker, who lost the 2010 race for governor, announces a second bid. “I care about this great state and the wonderful people who make it strong and call it home,” he says. In their dueling bids for political redemption, both will face primary challengers. March 2014: At the state Republican convention, party officials declare that gubernatorial candidate Mark Fisher has fallen short of the 15 percent delegate support needed to appear on the ballot alongside Baker — without announcing an actual tally. Fisher cries foul and sues, seeking legal fees and damages. Eventually the party agrees to put his name on the ballot. Fisher’s lawsuit is still pending. The Legislature passed a measure in the spring that would help the GOP raise money to fight it. May 2014: The Globe reports that Baker donated $10,000 in 2011 to the state party committee of Governor Chris Christie of New Jersey. Seven months later, a Christie-controlled pension fund committed $25 million to an investment firm that lists Baker as a partner. Baker says he is exempt from federal and New Jersey “pay-to-play” regulations that bar financial executives from making sizeable donations to political figures who oversee pension funds or to committees controlled by those politicians. In October, the New Jersey treasurer’s office says its review of the situation won’t be concluded until after the election. June 2014: The state’s highest court rules that a casino repeal measure can appear on the November ballot — a high-profile loss for Coakley who, as attorney general, had declared the referendum unconstitutional. She downplays the drama. “I am pleased that the Supreme Judicial Court has ruled on this issue of great interest to voters in Massachusetts,” she says. June 2014: Days later, another legal setback for Coakley as the US Supreme Court strikes down a state law creating buffer zones around abortion clinics — in a case with her name on it. Coakley casts herself as the champion of a just cause. “We fight our battles — we win some, we don’t win them all — we are going to keep fighting,” she says. Later, she encourages the Legislature to pass a new law that would pass constitutional muster. June 2014: In a speech to the Democratic convention, Coakley acknowledges party activists’ dismay with her 2010 Senate loss and assures them she’s in the governor’s race to win. She loses the convention endorsement to state Treasurer Steve Grossman. September 2014: Baker wins an easy primary victory over GOP challenger Mark Fisher. On the Democratic side, Coakley wins a three-way race by a closer-than-expected 6-point margin over her nearest competitor, Grossman. October 2014: The Globe reports that Coakley’s high-profile lawsuit against two federal agencies for refusing to sell homes in foreclosure to nonprofitsthat want to return them to their original owners would help just a single such nonprofit: the one run by the cochair of her campaign finance committee. October 2014: A pro-Baker group airs a tough ad accusing Coakley of not doing enough to protect children from abuse and even death. Coakley declares the ad “absolutely over the top” and “outrageous.” Standing by her side: Deborah Eappen, the mother of a young boy who died in the care of his nanny, a case prosecuted by Coakley. Baker says he opposes the tone of the ad but says its message is worth discussing. October 2014: Coakley rejects claims reported in the Globe by a former inspector general, Gregory Sullivan, that her office was reluctant to pursue an investigation against Salvatore F. DiMasi, the corrupt former House speaker, in 2008. “I don’t know why Greg Sullivan is saying that, but he is absolutely wrong,” she says. October 2014:In a TV debate, Baker chokes up while recounting a story he says he heard from a struggling South Coast fisherman. The moment becomes fodder for political debate: In the final hours of a campaign, do tears help or hurt? ■ In May Coakley was asked to name the rate of the state gas tax in an interview on WCVB-TV. Her guess: 10 cents. The right answer: 24 cents. Baker pounced. “Voters should certainly be asking how a candidate for governor can be so out of touch and uninformed about such an important topic.” Ouch. ■ In September Baker tried to wrap up a line of questioning from a female TV reporter like this: “Last one, sweetheart” — with a hand on her shoulder for good measure. Um, not good. The incident followed two earlier incidents that gave the Coakley camp fodder to call Baker insensitive to women: his slow response to the Ray Rice domestic violence fiasco in the NFL and his first, fumbled reaction to the Supreme Court’s Hobby Lobby decision on insurance coverage for contraceptives. 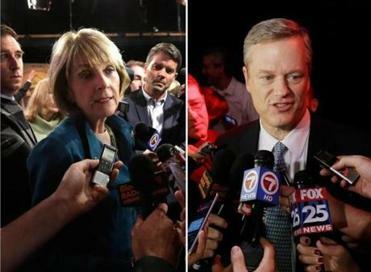 For many, many months public polling showed the race between Democrat Martha Coakley and Republican Charlie Baker as nearly a dead heat. Then, in mid-October, a Boston Globe poll showed Baker pulling ahead significantly. Coakley’s team pushed back, insisting the race remained close. “I know what kind of record The Boston Globe has. They always get it wrong, believe me,” she told a union rally in Boston. ■ Former Massachusetts senator Scott Brown moved to New Hampshire to run for the US Senate. He easily won a Republican primary and has spent the past two months locked in a close race with incumbent Democratic Senator Jeanne Shaheen, a former New Hampshire governor. He has depicted her as a rubber stamp for President Obama; she has portrayed him as a carpetbagger in the thrall of Big Oil. The small state has been inundated with harsh political ads— by Brown and Shaheen themselves and by third parties who are spending big. The race is one of a handful that will help determine which party controls the Senate. ■Some analysts predicted a vigorous war over casinos this fall — but the fight seemed to fizzle. Massachusetts voters will be asked whether they want to repeal the state law legalizing casinos. But polling in recent weeks has consistently shown voters willing to keep the law as is. ■ There are three other ballot questions facing state voters on Tuesday. One would repeal a law that created automatic increases in the state gas tax. Another would expand the bottle deposit law. A third would require employers to offer earned sick time to their workers. ■ In Massachusetts’ Sixth Congressional District, Republican Richard Tisei was gearing up for another shot at incumbent Democratic Representative John Tierney, who beat him in a close race in 2012. The voters had a different plan: nominating Democrat Seth Moulton, a war hero, to battle Tisei and creating an unexpectedly interesting general election matchup. ■ The Massachusetts Ninth Congressional District race is, surprisingly, competitive this year. Incumbent Democrat William Keating is working to fend off a challenge by Republican attorney John Chapman, a former Reagan White House aide and Romney administration official. ■ In Providence, former two-term mayor and ex-con Buddy Cianci announced in June that he would make a run for his old seat at age 73, as an independent. The announcement came on his radio talk show. Cianci’s previous terms were each marred by felony convictions. “Experience is a great teacher, but also a painful one,” Cianci said in the summer. In October, three of Rhode Island’s top former federal prosecutors warned voters not to trust him again. On Tuesday, he faces Democrat Jorge Elorza and Republican Dan Harrop. ■ Massachusetts Democrats nominated Maura Healey for attorney general in September — choosing her by a stunning 2-1 ratio over longtime pol Warren Tolman. She’s the heavy favorite in a general election matchup with Republican lawyer John Miller.